Well, it did at least eventually lead to our door. When last we met, our intrepid crew was holed up in the Redding Super 8, where one of the few comforts (almost making up for the nonfunctioning remote control, but not quite) was the presence of free Wi-Fi. My mom and I felt the need for some mama-daughter time, so I'm heading out tomorrow for four days in California. My dad's picking me up from the airport and I get to hang out with him for a few hours (yay! ), then we're going to the Stockton Symphony tomorrow night with my beloved brother (yay!)... and on Saturday, Mom and I are taking a class in journal-making with rubber stamps at the ever-fantabulous Castle in the Air (yay yay!). Knocking around Berkeley on Sunday, hanging about at ye olde Stocktonian stomping grounds on Monday, then winging back to Portland Monday night. Hoping also to get to see azureavian; we'll see if that works out. Whatever shall I wear? All this travel-related excitement is almost making me forget that for some reason my once so-reliable OpenOffice Writer has crashed and taken my two big fat time-consuming articles for the next issue with it. (Yes, I'd been saving them. No, I didn't have backups. Why would I back them up, when my Windows machine is so flawlessly reliable ha ha ha?) Almost. But not quite. Maybe this next glass of wine will make me forget; one can only hope. Behave yourselves while I'm gone, and do pop back in for round two of the Eighties-Off! on Tuesday morning. Also: Miss Teen South Carolina answers a question. So I've been in Chicago for CHA the last four days. Just sat down at my desk about ten minutes ago. Didn't leave any food out; no errant coffee cups; no breadcrumbs, not so much as a dried puddle of wine. So why are there ants infesting the top of my desk? The kitten, fortunately, likes to kill them. She is mighty, and they are her helpless prey. So we are no longer a one-car family. 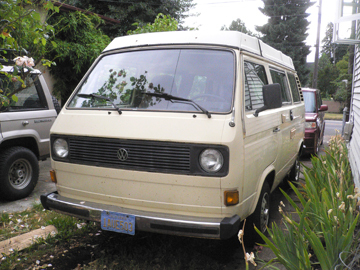 Once upon a time, a thousand or so years ago (well, twelve to eight), Jim and I owned a very fine VW Westfalia camper. It was "Taiga Green" in color, or "Taigagrün" in the original Deutsch, which I think rolls off the tongue beautifully. We took it up and down the California coast. We camped on roadsides. We camped in campsites. We honeymooned in it, and every morning we had delicious strong dark French press coffee. Then, in rapid succession, we had a baby, moved away from Santa Cruz and had absolutely no money. So we sold the little green bus. Bad move; sad mistake. How many times since then we have sighed with longing at the sight of a well-equipped Campmobile (should really ought to be Kampmobil, just to make me happy) shuddering its way doggedly up a gentle mountain slope! How often we have thought wistfully of the pop-top bed and its wafer-thin mattress, the swivelling brown laminate table, the determined little Tape Player that Could. So a few weeks or so ago, Jim found (on Craigslist o' course) this little bus going sadly unused in the distant realm of Scotts Valley. About twenty minutes' drive from Joe and Karan's house... Joe being, of course, our consummate mechanic buddy. Joe checked it out. Joe pronounced it good. We overnighted a money order, and the bus was ours sight unseen. And this last Sunday morning, we took time out from the round of wine tasting, window shopping, river paddling and generalized lounging that was our family vacation and headed down to Bonny Doon to pick up the bus from Joe and Karan's house. It was a long and arduous trip made longer and arduouser by our mistaking one road on our ill-marked map for another; but eventually our wee caravan made it back to Healdsburg. Yesterday morning, though, was the true test of the bus' mettle. Healdsburg to Portland, over windy roads and daunting hills and long stretches of indifferently maintained freeway. Soup365 #14some'n. Spin the globe, point a finger. Soup365 #124-1??. Where the hell is all the soup? Soup365 #123. Another late-night spectacular! Soup365 #122. Who you calling "meatball?" Jon Carroll on the "Pre-Pre-Pre-SAT"